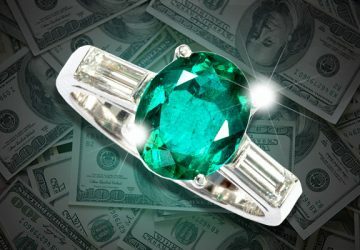 What does this have to do with the value of a Colombian Emerald? I had an office in Milan, Italy for many years. I sold Fine quality Medium Color, High Crystal, Bluish green Emeralds which are characteristics from the mine of Chivor. When I exported Fine Dark Herb Green Emeralds typical of the mine of Muzo to Milan. I couldn’t sell them, not even for the price they had cost me in Colombia! So, how much were the Emeralds worth? Who would have thought that geography played a role in this mystery! The farther north I offered Colombian Emeralds the lesser colored stones were more appealing. This, because there was less light in general at higher latitudes. Furthermore summers were shorter, autumn & winters longer. Finally, the light from the sun enters the Northern atmosphere at a higher angle going through much more atmosphere. As a result, sunlight picks up more color. This happens when the sun is low on the horizon creating a beautiful Yellow, Orange and Red Sunset. Red on the color wheel is on the opposite side of Green. 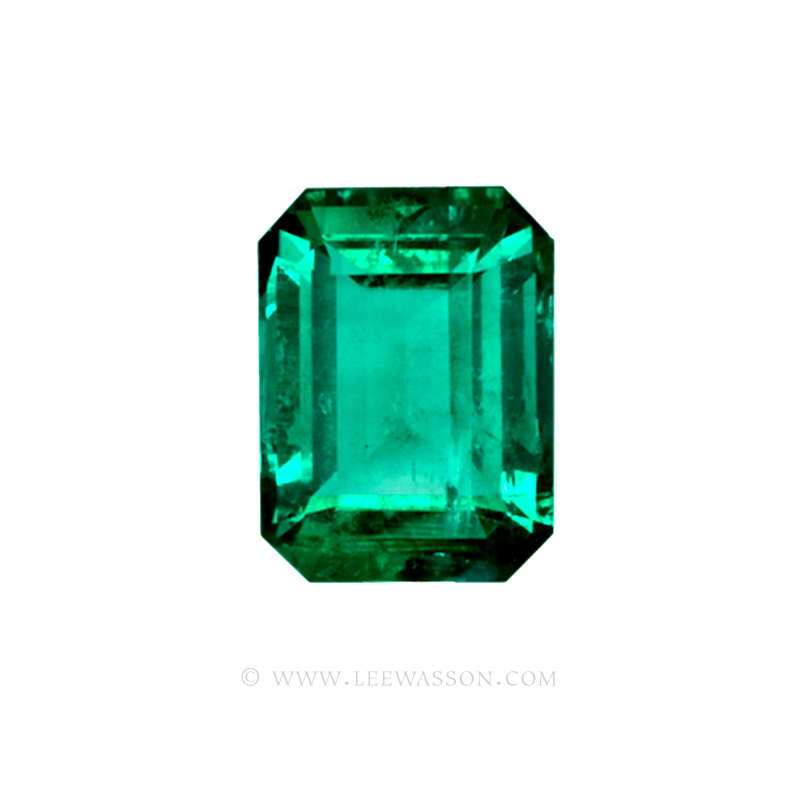 The contrast makes the Colombian Emeralds stand out, appearing darker. (Color Wheel). 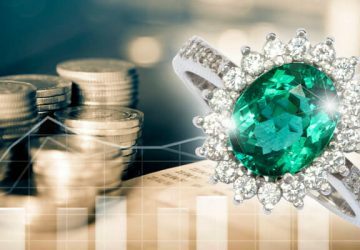 Therefore, if the Emeralds are lighter in color to start with they will appear darker and still have lots of brilliance in less illuminated conditions. (higher latitudes). The farther South and closer to the equator I offered stones, the darker color Emeralds from the mine of Muzo seemed to be more attractive. Thus more valuable for the exact opposite reasons. 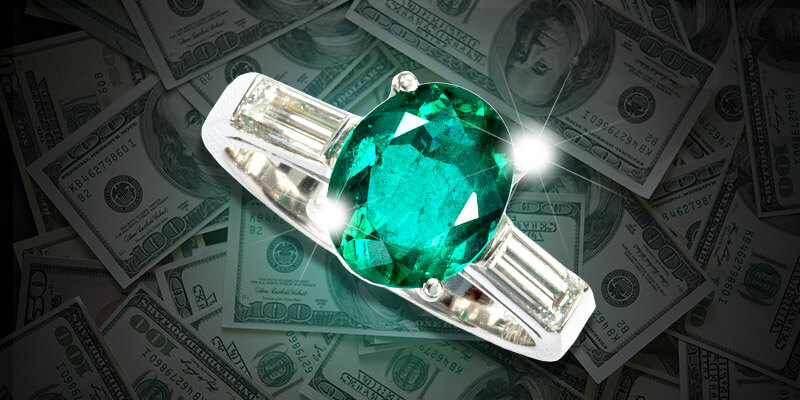 More direct light from the sun closer to the equator made the Darker Emeralds more lively and brilliant. More appealing, therefore more valuable than lighter color but brighter stones. Looking at emeralds in my office in Bogotá we will be in Sunlight. We are three degrees off the equator where sunlight hits the earth almost perpendicular. Plus, we will be looking at emeralds on a White background. A large thick pad of white paper which also absorbs the impact of an Emerald if it slips out of the tweezers and falls on the table. Much safer for the stone than a modern and elegant Glass table top! 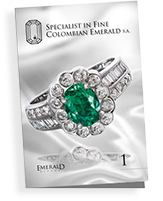 This is how you as a client will be able to see the true color and imperfections of the Colombian Emerald. 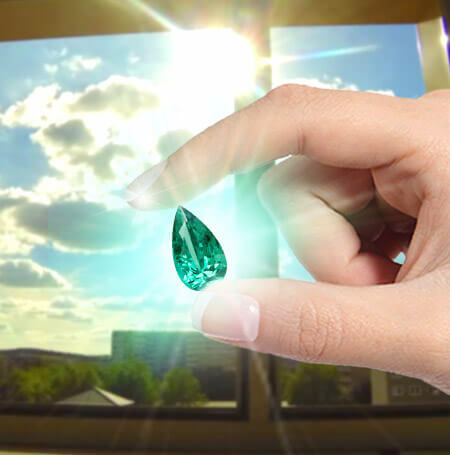 Sunlight is the only light that has the full spectrum of colors, therefore it affects the Emerald evenly. We can actually see the True color for evaluating purposes. As opposed to Sunlight, the spectrum of colors of Incandescent light/Warm LED light which is Living room, Restaurant, Ball room light etc. is in the Yellows, Oranges and Reds. 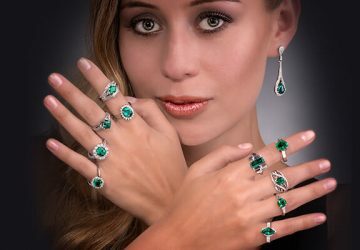 Again, opposites alters the Green of Colombian Emeralds creating more contrast, they stand out and appear darker. The spectrum of colors of Fluorescent light/White LED light; office, building light is in the Violets, Blues and Greens. 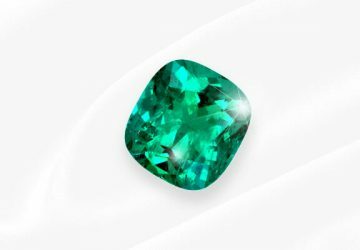 This does not contrast with green, thus washing emeralds color out. 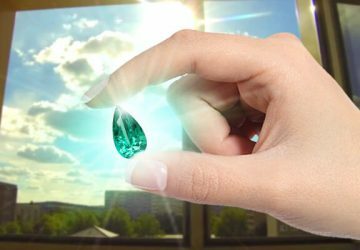 Using Sunlight to view Colombian Emeralds is traditional in the industry. That is the reason you see dealers in Bogotá with White Packets out in the open looking at cut Emeralds. Such as on the “Avenida Jimenez” and at the “Parque del Rosario”. Others are negotiating rough emerald material, holding them up to the sunlight and looking through them to see where the Color and inclusions are located. They are also calculating the probable loss in weight of the valuable rough gem material. Usually 50% to 70% is ground to dust, and how to minimize that loss by cutting the emeralds in the most advantageous way. Thus liberating the most Color and Scintillation while retaining the most Weight and Value from the stone.